We chose this Russian restaurant in Vilnius for afternoon lunch as I was curious to find the differences between Lithuanian and Russian dishes. I found that traditional Russian cuisine is rich and varied. Lija explained to me that even if it may look quite similar to Lithuanian it differs in combination of ingredients, seasoning and some cooking techniques. In this restaurant you will find everything that the Russians like: bright and colourful surroundings, amiable atmosphere and a plate of tasty and filling food. 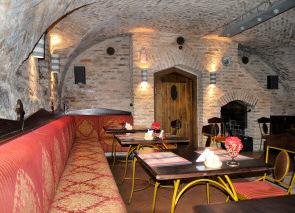 Often the interior of Russian restaurants in Vilnius is ornate and flamboyant and it’s easy to go over the top but not in this attractive cellar restaurant. The deco here is a tasteful combination of old fashioned Russian style and modern touches. Brick vault ceilings, tiled floor, old-fashioned gramophone and smiley waiters wearing traditional scarlet gowns create a cosy and welcoming environment. The restaurant has some history and it’s named after the famous Russian architect Nikolay Chagin, who lived in the same building in the late 19th century. You will find some meals on the menu named after him. Also don’t forget to look around at the old black and white photographs on the walls. There are several photos of Vilnius streets some hundred or so years ago. 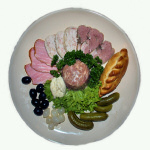 a variety of smoked and traditional jellied meat, small pies stuffed with fish sautéed with onions and a mix of pickled vegetables. For a starter they also offer a nice selection of Russian buffet salads. Lija went for one called herring in a fur coat (3 €) consisting of pieces of herring on a luscious bed of egg, mayonnaise, beetroot and other vegetables. I was lucky to have a taste of it and it was very tasty. 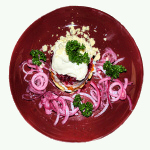 Keep in mind that Russian salads and appetisers are rich in ingredients and flavours and could serve as a meal itself. Apart from traditional meat and fish dishes it’s an excellent place to try traditional Russian pancakes or dumplings stuffed with anything you wish from mushroom, mashed potato and bacon, to caviar or just sweet cherries. For the main I chose Chabarovsk pelmeni with pork and salmon filling in a delicious shrimp sauce (6 €). A friendly good-humoured waitress who served us, willingly assisted us in a choice of our dishes. At the weekends they play live Russian music. By the way, Russians do love partying, so if you prefer a quieter, more romantic atmosphere we would suggest going earlier in the day, as it may get busy and noisy in the evenings. 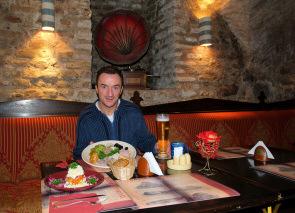 This Russian restaurant in Vilnius is situated in the city centre. To get there stroll along to the very end of Traku Street of the old Town cross the road and continue up Basanaviciaus Street for about 5min. The restaurant is on the right hand side, go downstairs to the cellars for more atmosphere. offered us a pot of tea.